Education Ministry and Defense Ministry blame each other for the tragic drowning of nine high school students. A mud slinging contest erupted between the Defense and Education Ministries over who is responsible for the tragic drowning of nine high school students in a sudden flash flood on Thursday. The twenty-five students had been on a hike organized by the Tel Aviv-based Bnei Tzion, a pre-army preparatory school. Army prep schools offer Israeli teens graduating from high school the opportunity to spend a year preparing for their mandatory military service. Immediately after the deaths were announced, the Education Ministry put out a statement clearing itself of any culpability in the drowning and blamed the Defense Ministry, which oversees all pre-military academies, for the disaster. "The ministry does not supervise or supervise the departure of pre-military preparatory courses, and the responsibility for the preparatory course is for the pre-military academies NGO and the Ministry of Defense. We just budget them," contended the Education Ministry. The Defense Ministry responded by noting that according to regulations governing pre-military programs, "the Ministry of Education is the professional body responsible for approving the curriculum in the pre-military preparatory programs. The Ministry of Defense is not responsible for the curriculum, including trips." "The ministry continues to monitor the disaster with great concern. It is very unfortunate that on such a day, not only does the responsible body not take responsibility but rather imposes it on someone else." Police Spokesperson Meirav Lapidot meanwhile blamed the Bnei Tzion staff for ignoring the flash flood warnings that it had disseminated. 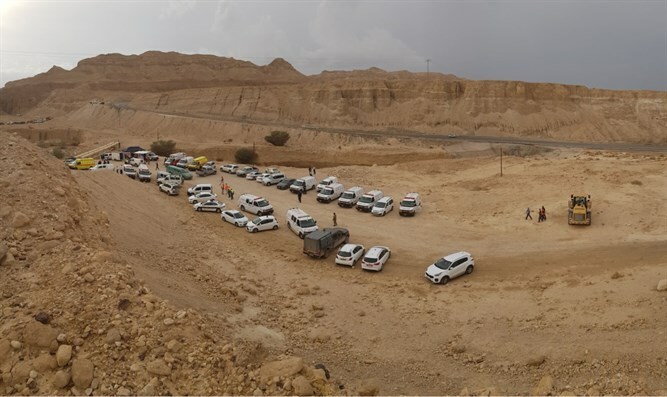 "The group of youths went on a trip to Nahal Tzafit despite our repeated warnings not to travel in the southern valleys," Lapidot told the Reshet Bet radio station. "It's a terrible tragedy and it's easy to avoid such disasters. All you have to do is listen to instructions," she added. "We are issuing many warnings all the time, and it is unfortunate that we have reached this situation." Police Commissioner Roni Alshiekh ordered a special investigative team established to probe the circumstances of the drowning. According to Hadashot, the students had expressed concern over the trip despite the torrential rain that has ravaged Israel over the past few days. “We’ll die! I’m serious," one of the deceased students had told her friend on the Whatsapp messaging application. "It makes no sense to go to a place where everything is flooding."